If you are suffering from TMJ (jaw) symptoms there can be many causes. Everything from the structure of your jaw and grinding of the teeth to a trauma such as the one above. Whatever the cause, jaw pain should not be ignored. The jaw meets the upper skull in front of the ear. The joint that connects these two bones is called the Temporomandibular Joint (TMJ). People with jaw problems can have problems in their TMJ(s) and/or the muscles of their jaw. Following an assessment, a diagnosis can be made and may be considered a temporomandibular disorder (TMD). TMD in Edmonton and St. Albert is treated at Leading Edge Physiotherapy by our specially trained physiotherapists. Once we have determined the cause, a specialized treatment program can be created for you. In addition to treatment, there are several general tips to help you to manage your symptoms. Heat or ice can reduce joint or muscle pains and relaxes the muscles. Apply moist heat for 15-20 minutes two to four times each day to the painful area. Ice may be applied for 10 minutes as often as every 2 hours. Eat a Pain-Free diet. Avoid hard foods and chewy foods. Cut fruits into small pieces and steam vegetables. Eat anything you want as long as it does not cause pain or locking in your jaw. Chew your food on both sides at the same time to reduce strain on one side. TONGUE UP, TEETH APART AND JAW MUSCLES RELAXED. Sometimes we do not realize that we are holding our jaw muscles even slightly contracted throughout the day. To relax your jaw, place the tip of your tongue on the roof of your mouth, let your jaw relax so that your teeth stay slightly apart and keep your lips together. Avoid Caffeine. Caffeine can cause your muscles to “tense” more and make them feel tighter. Caffeine or caffeine-like drugs are in coffee, tea, soda, energy drinks, chocolate, and some aspirins. Even decaffeinated coffee and tea still contains some amount of caffeine. Avoid oral habits that put strain on the jaw muscles and joints. These include teeth clenching, teeth grinding, touching or holding the teeth gently together, biting cheeks/lips, pushing your tongue against teeth or jaw muscle tensing. Also avoid biting on objects like pens or pencils. DO NOT CHEW GUM! Avoid resting your jaw on your hand (your skin will also thank you). Avoid activities that involve wide opening of the jaw such as yawning. When you feel like yawning, put the tip of your tongue hard against the roof of your mouth and let your mouth open as far as it can without letting your tongue off the roof of your mouth. Prolonged dental treatments with your mouth open should be avoided, if possible, until the pain has been reduced or eliminated. Avoid stomach sleeping as this puts strain on the jaw and neck muscles. Sleeping on your side is acceptable as long as you do not put force on your jaw. Sleeping on your back often works best. Use anti-inflammatory and pain reducing medications as per your doctor’s suggestions. Posture plays a role in TMD symptoms. 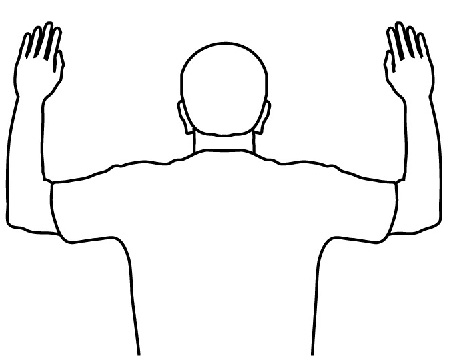 Try to maintain good head, neck and shoulder posture. You may find that a small pillow or rolled towel supporting your lower back may be helpful. Ensure you maintain good posture when using a computer and avoid poor postural habits such as cradling the telephone against your shoulder. 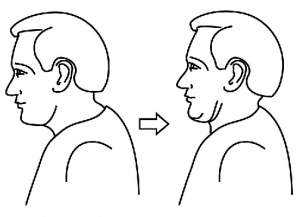 Chin Tucks: Gently nod your head, glide your neck back, and stretch your head upwards. 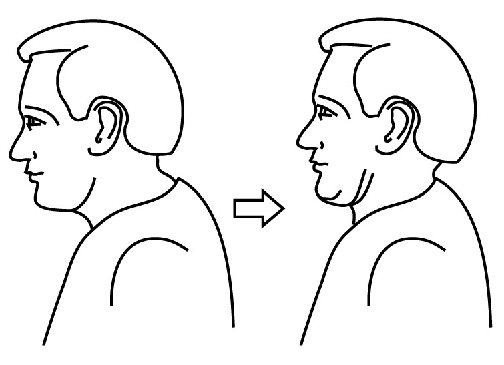 Think of your chin being comfortably closer to your neck. Perform 10 times every hour, hold each repetition for 5 seconds. 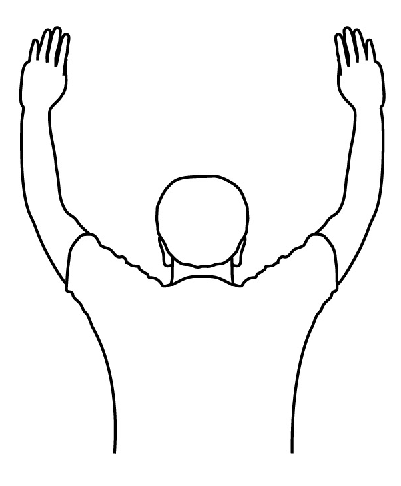 Chest Stretch: Stand in a doorway or the corner of a room. 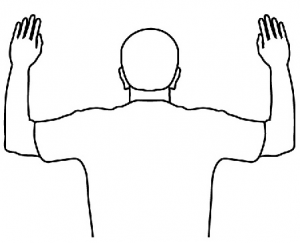 Lean forward, with your hands on the wall, until you feel significant stretch across the front of your chest. Do this exercise in both positions. Hold for 30 seconds, repeat 2-3 times per day. 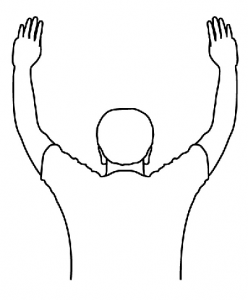 Shoulder Blade Retraction: Gently pull your shoulder blades down and in. Perform 10 times every hour, hold for 5 seconds. Our initial evaluation will involve a thorough history and physical examination by one of our specially trained physiotherapists. The assessment includes examination of posture, the cervical spine and the TMJ to establish a primary diagnosis. We will identify contributing factors, at fault structures and establish a treatment plan in conjunction with your dentist and/or another TMJ specialist if necessary. Why choose Leading Edge TMD Treatment? Leading Edge TMD treatments envelope the spectrum of available techniques and modalities found in today’s research. These are directed towards decreasing muscle tightness, reducing inflammation, improving range of motion, and decreasing pain. Treatment techniques utilized by our specially trained physiotherapist(s) may include: modalities such as heat, ice, transcutaneous electrical nerve stimulation (TNS), ultrasound, and Iontophoresis. We utilize a hands on approach when indicated that also includes specially trained techniques in myofascial release, joint mobilization, Graston Technique, acupuncture and intramuscular stimulation. Exercises are essential, but must be prescribed dependent upon the specific diagnosis. These often include: neck stretches, postural retraining, TMJ stretching, muscle relaxation techniques, controlled opening exercises of the TMJ, Rocabado and rhythmic stabilization exercises. One of the most important concepts we try to impress upon patients is to seek an assessment and treatment promptly. The sooner we can begin treatment, the less likely it will develop into a chronic irreversible condition. Please contact us to begin your recovery today. This information is not meant to replace the advice or treatment of a qualified physician or physiotherapist. It is meant for information only. Please seek an assessment and discuss your treatment options with your caregiver prior to making a decision about your treatment path.